Sculptra can be used to enhance and contour specific features of the face, including the cheeks, temples, chin and jawline. Sculptra gives you a fuller appearance in specific facial areas, with natural results that won’t give you away and emerge subtly over time (individual results may vary). The main ingredient in Sculptra is a biocompatible simple lactic acid based sugar, called Poly-l-lactic acid. Unlike other fillers, Sculptra stimulates the body to produce it’s own collagen. This production of collagen, termed neo-collagenesis, enables the skin to thicken up to three times its previous volume. Therefore the actual ‘filling material’ of Sculptra is your own natural collagen. 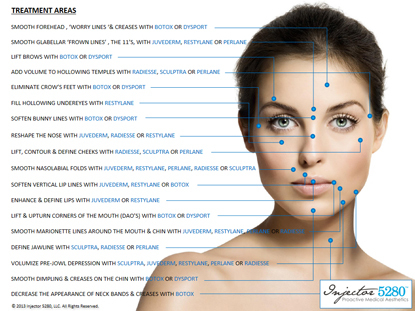 Which Areas can Sculptra be Administered? What Preparation is needed for Sculptra? To lessen the possibility of bruising and bleeding, 10-12 days prior to receiving injectable treatments we recommend avoiding aspirin, St.John’s Wort, Omega 3, high doses of Vitamin E, and non-steroidal anti-inflammatories e.g. Aleve, Motrin, Advil, and Ibuprofen etc. If you take aspirin for medical purposes, please continue use. If you have recently suffered from facial cold sores please notify your Aesthetic Injector prior to receiving injections, and follow our recommended treatment plan. The treatment begins with collectively mapping out your customized treatment plan, reviewing post-care and answering all your questions and concerns. Ten minutes prior to treatment, we start with the application of ice and a topical numbing cream which helps alleviate discomfort during the procedure. The injection process takes approximately 30-60 minutes and involves a series of small injections under the skin of the preferred treatment areas. There is very little downtime or recovery needed. Patients generally feel comfortable returning to their normal daily activities immediately following treatment. However, please refrain from any strenuous exercise that can cause a sweat for 24 hours. Sculptra injections, just like any other injection, can cause some mild redness, swelling and occasionally bruising. We have some special techniques that we use to minimize the swelling and bruising associated with Sculptra injections. However, if bruising and swelling do occur they will subside and fade. Localized temporary numbness is normal after Sculptra injections because the product is mixed with lidocaine. The lidocaine will wear off within a few hours and numbness will subside. Make-up can be applied 15 minutes after treatment. If you experience any mild aching at the site of injection after the procedure this can easily be controlled with Tylenol. Sculptra does take some additional aftercare, which we will explain and demonstrate to you prior to you leaving your appointment. The treated areas will need to be massaged daily to help the Sculptra distribute evenly. The injected areas should be gently massaged using moisturizer for 5 minutes, 5 times per day for 5 days. Remember 5x5x5. Immediately after the treatment you will see an instant increase in volume due to acute swelling and the sterile water used to prepare the Sculptra. Hence you will get an instant glimpse of the outcome you can expect. After 24 hours the swelling goes down and so does the new volume. However, over the next 4 weeks you will gradually see fullness and volume again, as your “new” collagen is thickening. Be patient during this time and allow the treatment 4 weeks before evaluating results. Remember Sculptra is generally completed in a series of treatments, so complete your treatment course before evaluating final results (individual results may vary). Typically to achieve long lasting and visible results, 2 to 4 treatments, spaced 4-6 weeks apart are required. The number of treatments you need depends on your level of volume loss and aesthetic goals. Because the number of treatments vary, we invite you to come in for a complimentary consultation. We will show you before and after photographs of patients we have treated, advise you on how many treatments you need and give you more of a definite price (individual results may vary). “Hi, I’m Kate, and I’m 43 years old. I think you have to be proactive with your looks as you get older. At some point you have to accept that you’re aging. But it doesn’t mean that you have to take it all at face value. There’s stuff you can do. I think every decade you make different choices too. I know I was always like, “I would never get any work done, I would never get any work done.” Now maybe just a little something something. I would want something that does it gradually. You don’t want to go from 0-60 You don’t want people to go, “Whoa.” Drastic is not good. I really want something that is long lasting. With stuff that they have now, you do these subtle things, you don’t have to have that (creaking sound). Discover the new age of anti-age. Sculptra aesthetic. The only facial injectable that provides noticeable results that emerge subtly for a more youthful looking appearance (individual results may vary). Of course, individual results and treatment sessions may vary for every patient. Renata is another Sculptra Aesthetic patient. From before, subtly, gradually to, be renewed. Renata’s before to after pictures speak for themselves. FDA-approved Sculptra Aesthetic is different in the way it works because it gradually replaces lost collagen. As you age, you may notice changes to your face. For example the appearance of shallow to deep facial wrinkles and folds. Over time, wrinkles become more apparent, primarily due to the breakdown of collagen among other factors. It is thought that Sculptra Aesthetic works within the deep dermus to help replace lost collagen. As collagen is replaced, it provides a foundation that gradually restores the look of fullness by correcting your shallow to deep facial wrinkles and folds (individual results may vary). The result, a refined, more youthful looking appearance. Sculptra Aesthetic is the only injectable that works gradually and can give you noticeable results (individual results may vary). Hi, I’m Franca. I’m living in Dusseldorf. I’m nearly 41 years old and I’m working as a model. Because I’m in this job and I’m working in front of the camera, I know my face. Sculptra was the one I chose because if there was a chance or a possibility to do something that looks natural, this is great, why not? Sculptra is something different. First of all, because it comes so gradual, it looks so natural (individual results may vary). I like the idea that my own collagen is what’s filling up and not something else. Of course, it takes longer, but it’s worth it when you think of it. My experience with the whole thing is a good one. I look a bit younger. I look refreshed, now I can see it. Franca is just one of many patients who got a more youthful looking appearance without looking like she had work done (individual results may vary).